Dan Wright has expanded from modifying your electronics to producing his own ModWright electronics brand. 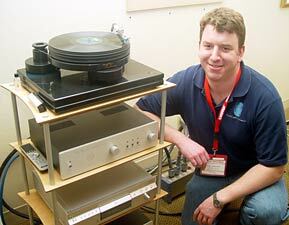 Here he is with his SWLP 9.0 SE tubed line/phonostage with an outboard power supply (expected retail of $3995 US). To be released later this year will be the SWP 9.0 SE stand alone phono stage (expected retail of $2495 US). That's a Nottingham Spacedeck turntable above the linestage and the Sony 9100ES below, which is tweaked with the Signature Truth mod ($2500 mod only). 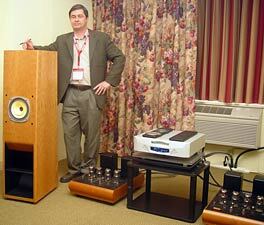 Luca Lusardi of Around The World is pictured here with Dr Bruce Edgar's latest Edgarhorn speaker and subwoofer. WAF (Wife Acceptance Factor) may be a touch on the low side, but you have to admire the finish on these babies, courtesy of Mitch Despaw of Middle Branch Furniture. 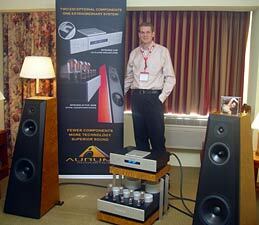 A company to watch is Aurum Acoustics, with its ambitious cottage industry one brand solution. Here all the parts are made to work together: the Integris CDP CD player with built in preamp, and active speakers with outboard active 300B based tube amplification. A complete high-end system in four (big) boxes! President and System Designer Derek Moss is pictured here with his system, but who the lady on the CD cover on top of the right speaker is - you'll have to ask Derek. A lovely natural sound too, with amazing extension at both ends for a tube system. I would like to spend some quality time with these finely tuned instruments and give you all a full report. 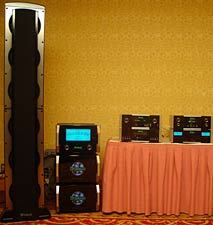 This system has sounded good at every show and is now in full production. Francois Lemay from RL Acoustique of St Bruno Quebec introduced me to the Lamhorn 1.8 Loudspeakers with new AER MD3B horn drivers ($11,950 Cdn). 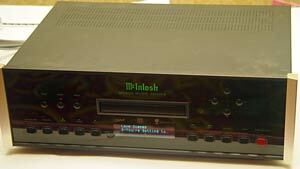 They are driven here by an Audio Aero Prestige CD/SACD Player and Tenor 75Wi OTL amps. Excellent presence and detail in this room! The same cabinet is available with a variety of other drivers at prices from $7250 to $16,500 Cdn. In just about the biggest room, I found just about the smallest speaker. And boy did it sound good! 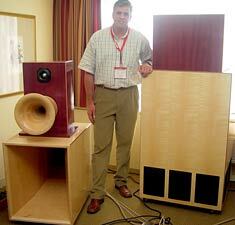 Meet the inexpensive Era Design 5 bookshelf speaker, distributed by Bruno de Lorimier of KonnectSon Canada. I believe he said the price is just $1200 Cdn, but don't kill me if I got that wrong because I lost the piece of paper I was writing on. Driving the Era are two delightfully inexpensive Concept Series components from Cary - the $2595 Cdn CDP-1 CD Player and the equally affordable CAI Integrated Amplifier at $3295 Cdn. 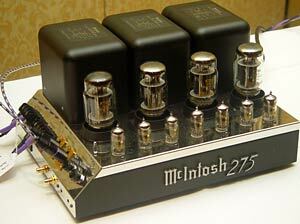 This is a solid-state amp putting out 125 wpc, and this combination sounds sweet. Bruno, send these three along to me please. You may not get them back for a while. A great system for under $8000! Plus a raft of big boxes you can see lined up here including the massive MC2KW 2,000 watt Monoblocks, the MCD201 SACD/CD Player and the XRT2K Loudspeaker System, complete with 110 drivers, of which 104 are titanium and other six merely aluminum coned. Who wants to sort out all the binding posts here? So there you have it. Best sound - a tie between Gamut and Sound Fusion. Most interesting moderately priced electronics - a thee way split: Linn, Cary and Valve Audio. Most over the top - McIntosh. Best paint job - Redpoint and Ars Aures. Best value speaker Era. Best looking introduction - Sonus Faber Guarneri Memento. Click here for main show page.